Looking down the coast from Hanalei. My trip this past weekend was my first time in Kauai, and I have to say that after just four days, I fell in love with this gorgeous island. That’s mostly thanks to the great suggestions I got from TPG readers about what to see, do and eat while I was there. Here are a few of the highlights from my trip, and thanks again to all of you who shared your tips with me! We got in on Thursday morning and spent the first part-day exploring the Grand Hyatt. We also picked up our rental car at Lihue Airport … only to discover it was a pick-up truck! That seemed a little odd, but little did we know that the next day—our first full day on the island—we’d be thanking our lucky stars because we decided to check out Polihale Beach on the west side of the island near Waimea. 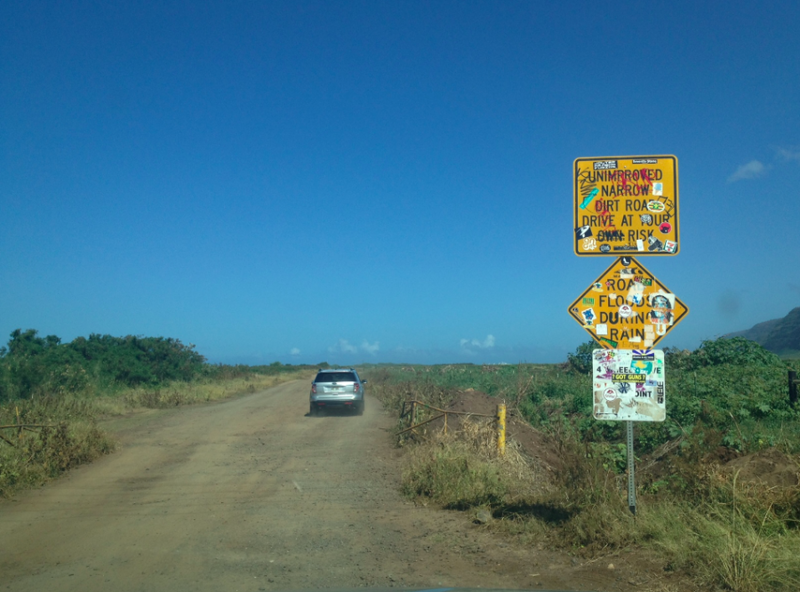 The bumpy road to Polihale Beach. Thankfully our rental was a pick-up! To get there, you need to take a bumpy dirt road for about 20 minutes, and it seems like it would have been practically impossible in a sedan. The ride was worth it, though, because the beach was beautiful. There was a stunning cliff falling to the water, the surf was beautiful (if a bit rough), and we had it practically to ourselves. Though the surf was rough, we decided to chance it and took a swim, bodysurfed, and had a good time, though it was probably a little dangerous and not the best idea. 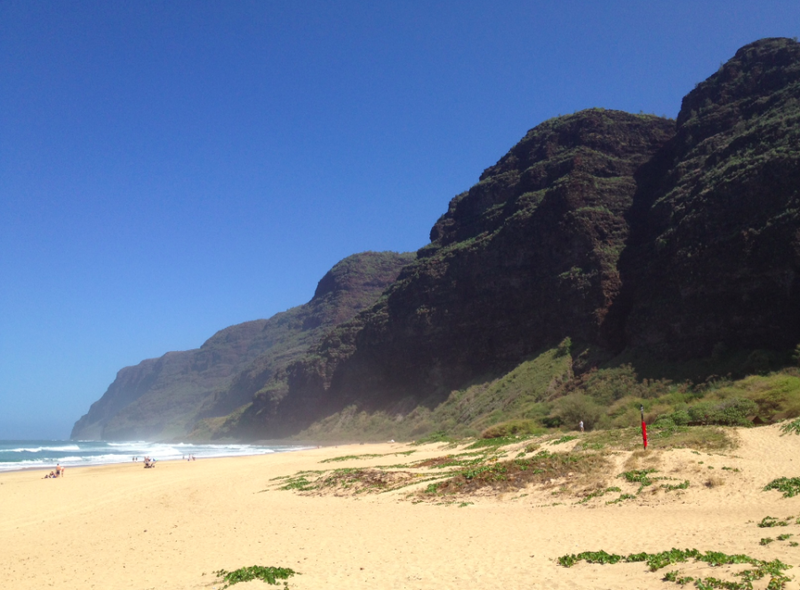 Getting to Polihale Beach was worth the bumpy ride. We practically had it to ourselves. My suggestion would be to bring snacks since there’s literally nothing there. 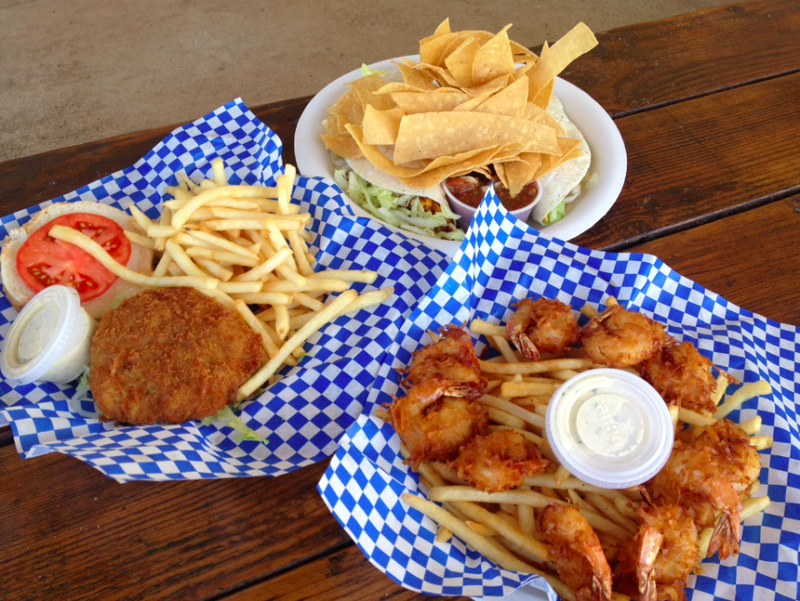 After a few hours, we had worked up an appetite, so we went to the Shrimp Station in Waimea, which several readers had recommended, and had a deep-fried lunch of coconut shrimp, shrimp tacos and shrimp burgers, which were my favorite. Shrimp Station in Waimea. Loved the shrimp burger. After gorging on all that fried food, of course we needed to stop at Jo Jo’s for some shave ice, which is basically a bunch of ice cream with shaved ice in various flavors. I had one with strawberry, coconut, pineapple, shaved coconut, coconut ice cream and macadamia nut ice cream, which was out of this world, and I’m still thinking about it. Shave ice at Jo Jo's. I'm still dreaming about the macadamia ice cream! On the way back to the Grand Hyatt, we were going to drive the Waimea Canyon, but we wanted to get back for sunset at the Beach House in Poipu so we could meet some friends who brought along pineapple champagne made in Hawaii so we could have drinks on the beach. It was the perfect end to the day. Dinner at the Beach House was also nice—excellent service and great view right on the water. The food was just good, not great, just fresh seafood. Sunset from Poipu Beach near the Beach House restaurant. Perfect! The next day, we drove the 75 minutes between the Grand Hyatt in Poipu on the south shore of Kauai to the St. Regis Princeville (where we spent our next two nights) on the north shore, stopping along the way to see the Wailua Falls. They were beautiful, but no Iguazu. Just pretty waterfalls in the jungly hillsides. When we got to the St. Regis, we spent a lazy day by the pool, which had awesome views of Hanalei Bay and perfect service. In the afternoon, I got a hot stone massage at the spa, which, like much of the rest of the experience at the resort was gorgeous but expensive. That night, we ate dinner at Jean-Georges Vongerichten’s Kauai Grill at the resort, which I mentioned in my hotel review of the St. Regis. It was time for a more active day, so I had our St. Regis butler Alfredo book us a surfing lesson with Hawaiian Surfing Adventure in the morning for two hours for $75 a person. This was probably my favorite part of the trip. Our instructor was Shawn, a native Hawaiian who grew up surfing from the age of three. It was just my friend and Sean and me hanging out on the beach learning the basics. I was nervous about it because I’m so tall and don’t know what my center of gravity was going to be like, but Sean was a great teacher, and after 15 minutes of talking us through the basics on the beach, we got into the water, and I actually caught my first wave and rode it to the shore! Plus it was a great workout. Hanalei Bay was a fantastic place to learn since the waves were gentle, it’s got a sandy bottom, and it even started raining at one point, which was just beautiful. Everyone told me I had to see the Na Pali Coast, which has to be one of the planet’s most beautiful settings. To do so, you’ve got a few options: a rigorous all-day hike (which we didn’t have time for), a catamaran or zodiac boat ride, or a helicopter. I’m not a huge fan of helicopters because of a bad family experience, so I had originally made a reservation to take a zodiac ride while I was staying at the Grand Hyatt since they only leave from the south coast in winter. Unfortunately, it had been canceled due to rough seas, so in order to see the cliffs, I had to take a helicopter tour from the northern coast during my stay. Our trusty ride for the morning! 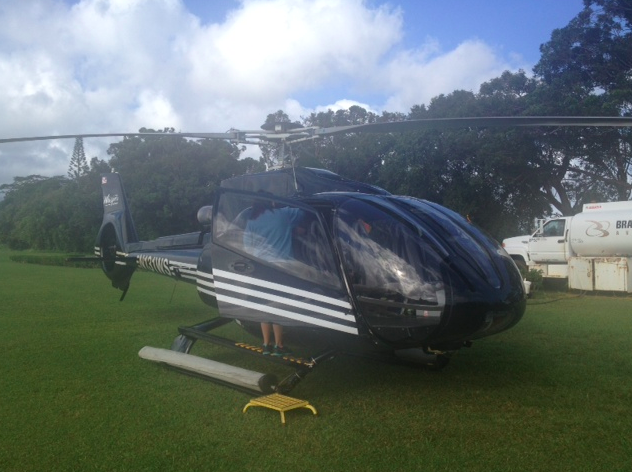 I decided to pay $314 for a 45-minute tour with Sunshine Helicopters that departed from the Princeville Airport just a few minutes from the St. Regis. My misgivings were slightly assuaged by the helicopter itself, which was a beautiful, big new machine with four seats in back and three up front, as well as our outgoing pilot who said he flies eight flights a day. 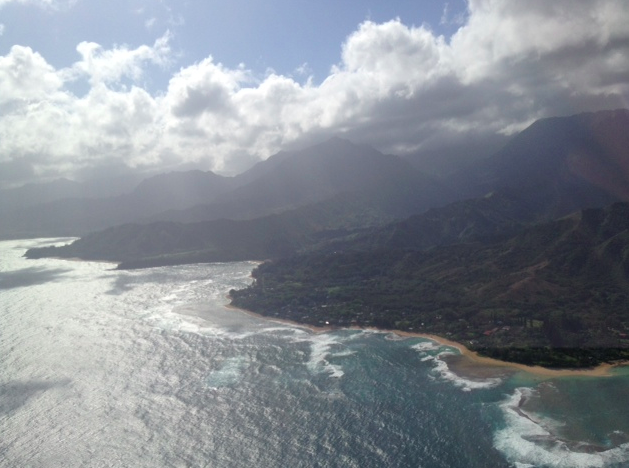 The weather was perfect with very little cloud cover, and our pilot took us along the coast of Hanalei Bay, through the Waimea Canyon (we finally got to see it!) 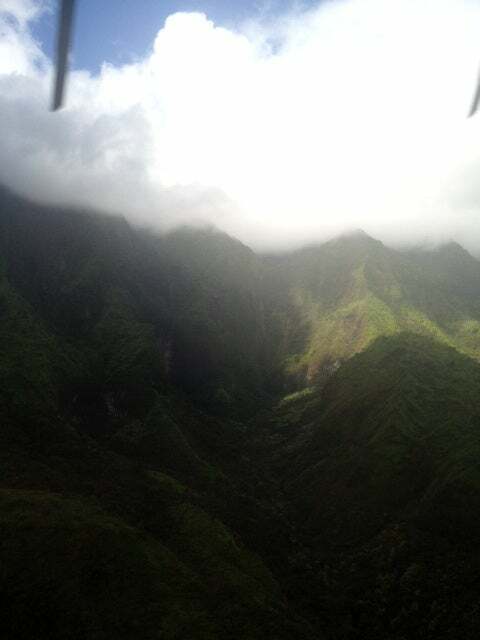 and flew us along crevices in the landscape that were just unbelievable, then up to rainy Mount Waileale, where he literally flew us through a cloud. Beautiful mountains in the interior. 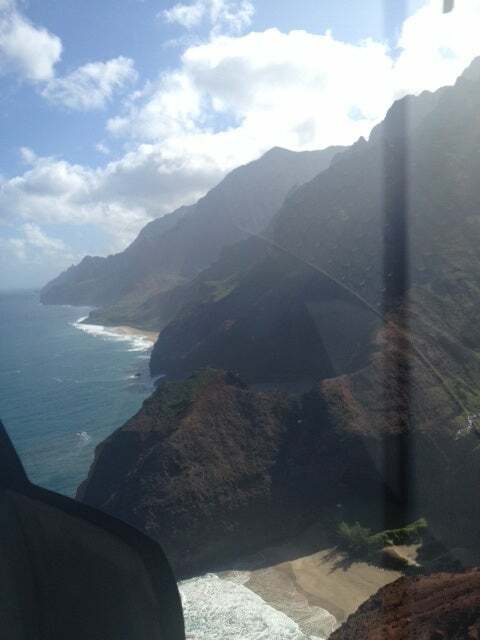 There were definitely a few moments of turbulence that made me wish I was back on solid ground, but I have to say that the entire experience was worth it, especially when we flew past the coastal cliffs and out over the ocean for those famous views of the Na Pali coast. We could even see whales breaching in the water below us. 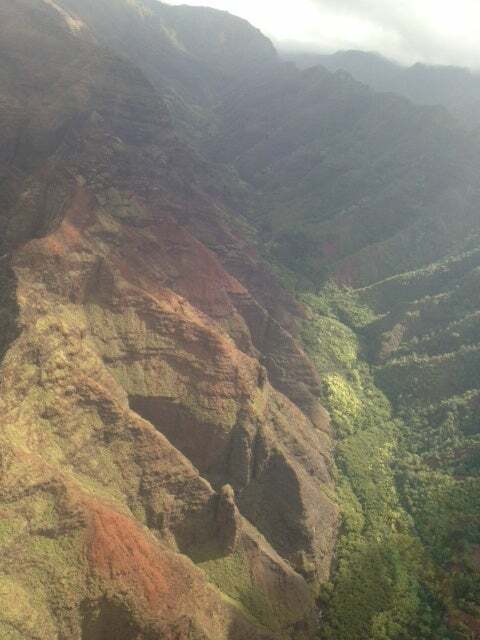 The dramatic Na Pali Coast. It was just incredible—one of those experiences where you feel vulnerable and have to take a risk, it’s pricey, especially just for 45 minutes, but those memories will last me a lifetime. You can get a small glimpse of them yourself by having a look at some of the video I shot from the helicopter ride below. I think it’s fair to say that I’m obsessed with Kauai now. I’d always heard how gorgeous it was, but I had to go there myself to truly appreciate it, and luckily, I had all of you suggesting fantastic experiences along the way that made my trip really special. As I mentioned in my post last week before I took off for Kauai, I wanted to reward one lucky TPG reader who commented or tweeted me with a suggestion for my first trip to the island. The winner of the 10,000 Hyatt Gold Passport Points is: Vishal, who also provided one of the most thorough list of comments I got on my trip, with lots of helpful advice. Thanks Vishal! I’ll be in touch soon with your points. 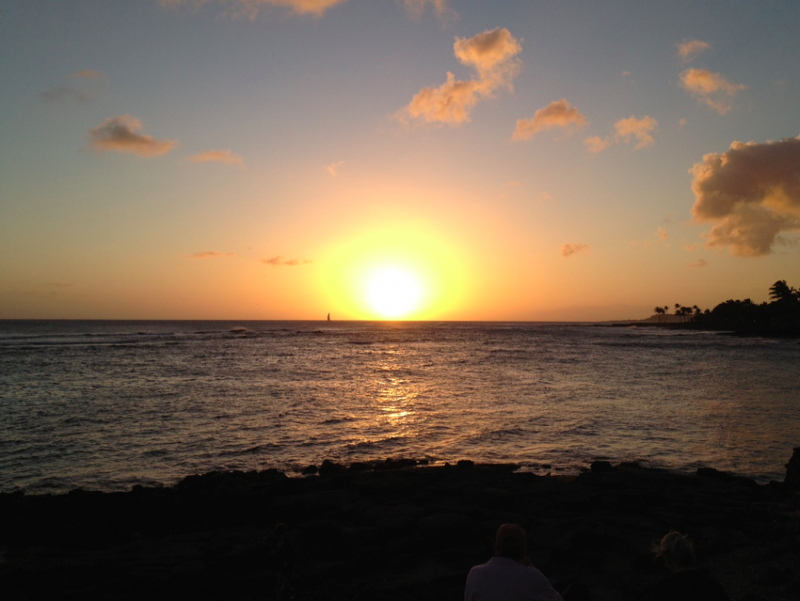 Take a look at the gallery below for my highlights, and let me know some of your favorite things to do on Kauai! The bumpy road to Polihale Beach. Thanks goodness our rental was a pick-up! 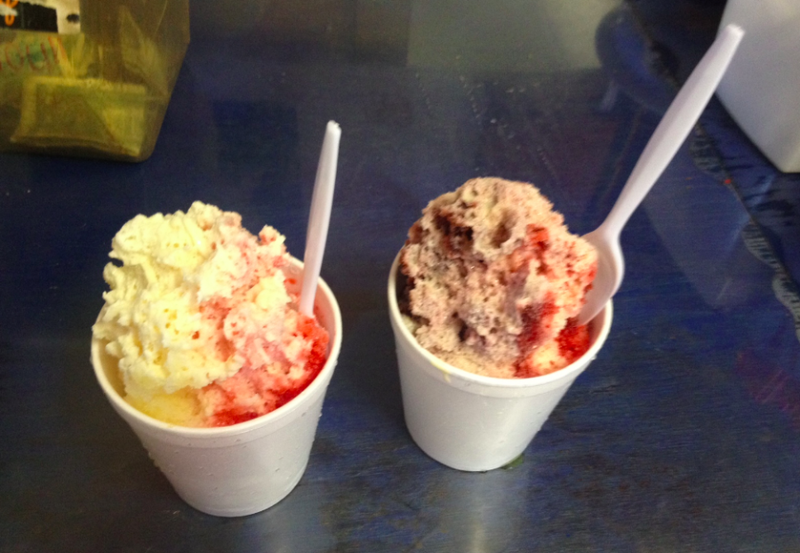 Jo Jo’s Shaved Ice: a Kauai landmark and apparently a TPG readers’ favorite! Shaved ice at Jo Jo’s. I’m still dreaming about the macadamia ice cream! Gorgeous waterfall…it just kept falling and falling! Flying along a beautiful river valley.